With some help from Walgreens and Rite Aid and a more than a bit of luck (served up by the FTC), the one-time regional discount chain, Fred’s Inc., could become the third largest drug-store chain in the US and take a giant step towards the company’s stated goal of transforming itself into a national healthcare company. In December, Fred’s agreed to purchase 865 Rite Aid locations as part of Walgreen and Rite Aid’s plan to gain FTC favor for their pending merger, the same merger that’s been in the works since October 2015. Fred’s hopes, though, have been diminished in the last few days. Friday’s deadline for the Walgreens-Rite Aid deal (upon which the Fred’s deal hangs) came and went with no action from the FTC. For their part, Walgreens and Rite Aid are committed to continuing their pursuit of the deal and have again extended their self-imposed deadline to July 31, 2017. The bad news for Fred’s is that recent reports note one of the largest hurdles in gaining FTC approval for the Walgreens-Rite Aid merger is the FTC’s lack of confidence in Fred’s ability to successfully integrate the Rite Aid stores. But what would a larger Fred’s look like? 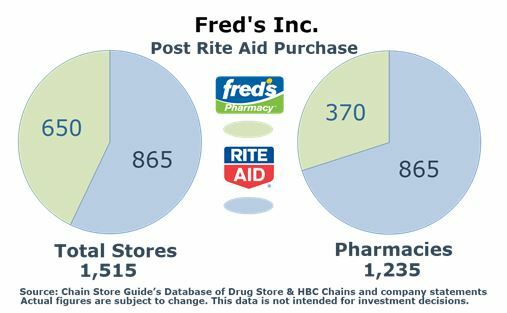 The 865 stores Fred’s intends to purchase have been described as largely representative of Rite Aid’s overall performance. That’s good news for Fred’s in that it’s not getting the dogs; the bad news is that the overall performance of Rite Aid hasn’t been stellar. Add to that the fact that Fred’s has been ringing up net losses and declines in same-store sales in recent quarters, and we can see why the FTC may be wary. Although, much of the increase in expenses can be placed in the “transformational” bucket – cutting dead inventory weight, closing underperforming stores and bringing in consultants for the Rite Aid deal. With 865 new stores, Fred’s would more than double its total footprint to 1,500+ stores. And as Fred’s current lineup only features 370 pharmacies amid its 650 locations, its pharmacy count would more than triple, likely necessitating a major overhaul of its pharmacy operations. 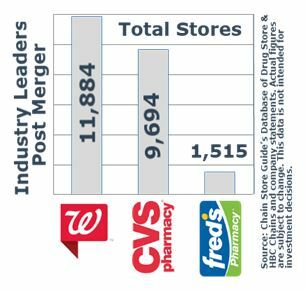 If and when the Walgreens, Rite Aid and Fred’s deals close, Chain Store Guide will sort through the three companies’ combined 230+ personnel and 13,000+ physical locations available to clients and customers via our Drug Store & HBC Chains PLUS database and our custom market share and store location services.